Offering you a complete choice of products which include ointment manufacturing plant. cGMP Ointment Manufacturing Plant is an ideal tools for the pharmaceutical & cosmetic industries for the production of Ointment, Cream, Lotions, Tooth Paste & other emulsions & homogenization. All contact parts are of S.S. 304 quality material (SS316 provided on demand). Capacity available in 50 ltrs. To 1000 ltrs. 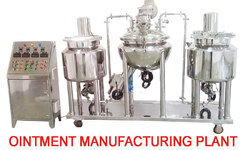 Looking for Ointment Manufacturing Unit ?